Product Features 1 year warranty. 30 days money back. Brand-new, no refurbished. Korea or Japanmade grade A cells. Ratings: 4400mAh,11.1V 7800mAh,11.1V Replacement acer aspire 4741 battery. Li-ion battery have no memory effect and environment friendly. Average run time:2-4 hours(minimum). Recharge time : 2-3 hours. Strict Li-ion battery circuit management. 350-550 full charge(discharge) times at least. 100% compatible with original equipment charger. Li-ion technology gives battery a long life and light weight. built-in rechargeable aspire 4741 battery protection circuit. Certification: CE, CCC, Ul, ISO9001, ROHS. Battery Tips Do not throw the battery pack into the fire, as this could cause the explosion of the battery. Do not setting your battery acer aspire 4741 pack in the high humidity, high temperature, strong vibrative and dusty place. Do not dispose of battery used with other solid waste because they contain toxic substances. Do not heat the battery, as this could cause leakage of alkaline solution or other electronic substance. Do not disassemble acer aspire 4741 battery, as this could cause leakage of alkaline solution or other electrolytic substance. Do not left the battery unused for a long time or place battery in device for a long period of time if device is not being used. Do not expose the battery to direct sunlight or shock the battery pack by dropping or throwing it. 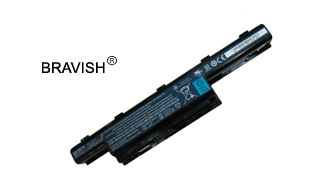 Do not store or use the acer aspire 4741 battery in a locked and unventilated vehicle, where excessive internal temperatures may occur. Do not short-circuit the battery, either inadvertently or intentionally bringing the terminals into contact with another metal object such as necklaces or hairpins, this could cause a fire and damage the battery. If the liquid inside the battery leaks, use large quantities of water immediately to wash any liquid with a synthetic detergent. Keep the battery away from heat or fire, if you detect the issuance of an extraordinary odor or leakage of alkaline solution or other electrolytic substance, please dispose used batteries in accordance with the regulations that apply to the disposal of acer aspire 4741 batteries.